Here is our vision for Cottage Grove Park, as opposed to that of TxDOT. Bobby Dean Phillips of StopTxDOTNow.Org will be speaking in Austin on Thursday, Sept. 7th at 7pm at the ACC Pinnacle Campus, Student Commons Room, at 290 West in Oak Hill. For more information, you can also visit www.Fix290.org. Re: "More Toll Road Tremors" [News, Aug. 18]: Mike Heiligenstein, director of CTRMA, used our tax dollars to make dopey commercials (Hey kids! Tolls are great!) to coax and lull people into accepting tolls. Drawbacks, such as rising costs of goods and services caused by tolls, traffic snarls caused by drivers avoiding tolls, or that it's a misdemeanor (with all the costs and penalties that implies) to drive on toll roads without paying are "conveniently ignored" by Heiligenstein. In 2004 Heiligenstein said it would take a gas-tax increase of $2 to $3 per gallon to avoid toll roads. CAMPO's estimate was that it would take 2 cents per gallon to avoid them. The power and money CTRMA will have in the future hinges on how many toll roads Heiligenstein can sell. Contrast his motives with those of PODER – working to save East Austin's poor and working class from financial hardship. PODER didn't "conveniently ignore" anything. There is a disproportionate number of freeways being converted to toll roads in east Travis County. TXDOT, CTRMA, and CAMPO are components of a toll-road machine started by Rick Perry. They never even tried to think of other ways to meet our road needs. There are viable alternatives, but this machine is powerful and money-driven. Grassroots toll-opposition groups are not Luddites – we are trying to keep our tax-paid transportation infrastructure from being a revenue source for private interests. During the meeting, CAMPO's chairman Gonzalo Barrientos bullied PODER's speakers until one man was roundly applauded for saying he wasn't going to take Barrientos' disrespect anymore. Let's see a report on that in the Chronicle. (Austin) – On the final day the Texas Department of Transportation accepted comment on the Trans Texas Corridor, Texas Comptroller Carole Keeton Strayhorn, Independent Candidate for Governor, today told the agency her administration will expand IH-35 using existing rights of way, implement the ports to plains initiative, expand her successful use of telecommuting and appoint an inspector general to oversee the agency and a transportation ombudsman to talk to Texans. “This agency is not listening to the people,” Strayhorn said. “At 56 hearings over 21 days, TxDOT ignored the overwhelming majority of people who testified against the Trans Texas Catastrophe. They even went so far as to tell Texans that they could not stop this boondoggle – even if they elected a new governor. “Well, they are dead wrong. I will blast this corridor off the bureaucratic books and replace it with a common-sense plan to address our transportation needs. Strayhorn’s plan includes protecting Texas farm and ranch land, improving coastal evacuations, increasing capacity of existing freeways and railways, encouraging family-friendly telecommuting, and appointing an independent inspector general over TxDOT as well as an ombudsman to listen to the people. Strayhorn testified against the Trans Texas Corridor at 14 public hearings held by the TxDOT, at which she detailed revenue sources available to the state instead of tolls. The Governor refuses to back off his Trans Texas Corridor plan, despite widespread opposition from Texans at the hearings. “I stood with Texans from the Rio Grande Valley to the Red River who oppose the Governor’s attempt to seize land and build toll roads across Texas,” Strayhorn said. “I listened to the people of Texas and the people of Texas are overwhelmingly opposed to this $184 billion boondoggle. Strayhorn submitted three reports to TxDOT – their own 1999 state analysis calling for the expansion of IH 35 using existing rights of way, the Ports to Plains study that will relieve existing congestion by improving transportation from South Texas through West Texas using existing roads, and her recommendation to expand telecommuting. “Family friendly telecommuting is up to 15 percent in my agency,” Strayhorn said. “The employees love it, it keeps folks off the road, and it works,” she said. Use telecommuting and staggered work schedules to ease traffic congestion and decrease pollution. Strayhorn’s transportation plan is part of her Texas First Agenda, a series of initiatives and solutions that she will be releasing in the coming weeks. This is the last day the Texas Department of Transportation is accepting comments on the Trans Texas Corridor and I am outlining my transportation plan and submitting three documents I hope they will consider as they review this ill-conceived project. The documents show how we can expand IH-35 using existing right of ways, implement the ports to plains initiative and expand my successful use of telecommuting. As part of my plan, I am also announcing today that I will appoint an inspector general to oversee the agency and a transportation ombudsman to talk to Texans. This agency and the Austin establishment are not listening to the people. At 56 hearings over 21 days, TxDOT ignored the overwhelming majority of people who testified against the Trans Texas Catastrophe. They even went so far as to tell Texans that they could not stop this boondoggle – even if they elected a new governor. Well, they are dead wrong. I will blast this corridor off the bureaucratic books and replace it with a common-sense plan to address our transportation needs. My plan is a better approach than the Governor’s secret agreement with a company based in Madrid, Spain, to seize more than half a million acres of private Texas property and build toll roads across Texas. The Governor said if someone has a better idea then lay out that plan. I went to the hearings and I listened to the people and today I am outlining a better plan – one that puts Texans first, not special interests. My plan includes protecting Texas farm and ranch land, improving coastal evacuations, increasing capacity of existing freeways and railways, encouraging family-friendly telecommuting, and appointing an independent inspector general over TxDOT as well as an ombudsman to listen to the people. Texas property belongs to Texans, not foreign companies. To meet our transportation needs we need freeways not toll ways, and we must use existing rights of way and increase efficiency of existing roadways and ports. We must not destroy our precious farm and ranch land. I testified against the Trans Texas Corridor at 14 public hearings held by TxDOT, where I detailed revenue sources available to the state instead of tolls. The Governor refuses to back off his Trans Texas Corridor plan, despite widespread opposition from Texans at the hearings. I stood with Texans from the Rio Grande Valley to the Red River who oppose the Governor’s attempt to seize land and build toll roads across Texas. I listened to the people of Texas and the people of Texas are overwhelmingly opposed to this $184 billion boondoggle..
Texans deserve to hear the truth. And the truth is much of the work to help Texans get from here to there has already been done..
Two of the reports I am sharing with the people of Texas and that I am sending to TxDOT are their own -- a 1999 state analysis calling for the expansion of IH 35 using existing right of ways, let me make very clear, using existing right of ways without tolls, and the Ports to Plains study that will relieve existing congestion by improving transportation from South Texas through West Texas using existing roads, and without tolls, and my own recommendation to expand telecommuting..
Family friendly telecommuting is up to 15 percent in my agency. The employees love it, it keeps folks off the road, and it works..
5. Use telecommuting and staggered work schedules to ease traffic congestion and decrease pollution. Texas once had and can again have a freeway system that is the envy of the nation. I will make that happen. 6. I am adamantly opposed to any toll roads in Texas. TxDOT has a new quarterly magazine and its first publication is now available online. The quarterly called Horizon is seeking manuscripts, preferably original, (i.e.,articles, commentary, and book reviews) which are timely in scope and relevant to transportation. If you know of someone with credentials/background in transportation or finance who is in a position to offer an authoritative perspective that challenges TxDOT's PR blitz please forward this information to them. Horizon, a quarterly policy publication, examines topics across all modes of transportation, reflecting the concerns of policymakers and leaders in government, industry and the general public. It provides analysis and commentary from transportation experts. A Quiet Crisis in Transportation Finance: Options for Texas by Martin Wachs, Ph.D., RAND Corporation. Discusses transportation financing choices facing state and local governments. The Return of Private Toll Roads by Robert Poole and Peter Samuel, Reason Foundation. Outlines the history and significance of tolling. Mobility: All Roads Lead to Texas by Joseph Giglio, Ph.D., Hudson Institute. Emphasizes the need for innovative funding strategies for mobility projects. Thinking about the Future of the Highway Program by Kenneth Orski, Editor, Innovation Briefs. A commentary challenging us to engage in the important transportation funding conversation. Deadline for Submissions: August 31, 2006 to John Sabala at TxDOTHorizonEditor@dot.state.tx.us • (512) 416-2386. Submission Guidelines for authors Horizon is a journal of the Texas Department of Transportation, Government and Business Enterprises Division. It provides innovative and trend-setting articles about transportation policies in Texas and throughout the world. Research findings and policy issues are presented in accessible language to allow for discussion among policy-makers, professionals, and citizens. The journal seeks manuscripts, preferably original, (i.e., articles, commentary, and book reviews) which are timely in scope and relevant to transportation. 2. Acceptance of manuscripts for publication is subject to approval by the editorial staff. 3. The author must inform the editor if the article has appeared in, or was submitted to, any other publications. The author must provide written approval from the publication in which his article appears. If the article was presented as a paper at a seminar or other event, please state the location, time, and event. 4. Sales presentations for organizations, promoting a particular product or service, are not suitable for publication. 5. The text of manuscripts is to be double-spaced and 12-point type. Articles are limited to a maximum length of 2000 words (approximately 5-6 pages); commentary and book reviews are limited to a maximum of 1000 words. 6. The manuscript should have a title page which includes the names, affiliations, addresses (mailing and email) and phone numbers of all authors. Brief biographical sketches for all authors should be included with the manuscript. 7. Include an abstract that briefly describes the contents, procedures, and results of the manuscript and does not exceed 100 words. 8. Endnotes are to be used rather than footnotes and placed at the end of the manuscript. Footnotes may be occasionally used within the document for clarification purposes, but not for citing references. 9. The Modern Language Association Style (MLA) is to be used for endnotes and references. At the end of the manuscript, complete references are listed alphabetically (not by number) by author surname, government agency, or association name. • If you provide photos, please include caption, photographer’s credit, and written permission from the photographer for each image. • If sending compressed files, please send as a self-extracting file (SEA). • All photos must be scanned or saved at 300 dpi or greater and sent separately from the document. Please send photos in high resolution: JPG, TIFF or GIF file formats. Built upon Thirteen Techniques for Truth Suppression by David Martin, the following may be useful to the initiate in the world of dealing with veiled and half-truth, lies, and suppression of truth when serious crimes are studied in public forums. This, sadly, includes every day news media, one of the worst offenders with respect to being a source of disinformation. Where the crime involves a conspiracy, or a conspiracy to cover up the crime, there will invariably be a disinformation campaign launched against those seeking to uncover and expose the truth and/or the conspiracy. There are specific tactics which disinfo artists tend to apply, as revealed here. Also included with this material are seven common traits of the disinfo artist which may also prove useful in identifying players and motives. The more a particular party fits the traits and is guilty of following the rules, the more likely they are a professional disinfo artist with a vested motive. People can be bought, threatened, or blackmailed into providing disinformation, so even "good guys" can be suspect in many cases. 1. Hear no evil, see no evil, speak no evil. Regardless of what you know, don't discuss it -- especially if you are a public figure, news anchor, etc. If it's not reported, it didn't happen, and you never have to deal with the issues. Example: Media was present in the courtroom (Hunt vs. Liberty Lobby) when CIA agent Marita Lorenz 'confession' testimony regarding CIA direct participation in the planning and assassination of John Kennedy was revealed. All media reported was that E. Howard Hunt lost his libel case against Liberty Lobby (Liberty Lobby's newspaper, The Spotlight, had reported Hunt was in Dallas that day and were sued for the story). See Mark Lane's remarkable book, Plausible Denial, for the full confessional transcript. Proper response: There is no possible response unless you are aware of the material and can make it public yourself.. In any such attempt, be certain to target any known silent party as likely complicit in a cover up. In this case, it would be the entire Time-Warner Media Group, among others. This author is relatively certain that reporters were hand-picked to cover this case from among those having intelligence community ties. 2. Become incredulous and indignant. Avoid discussing key issues and instead focus on side issues which can be used show the topic as being critical of some otherwise sacrosanct group or theme. This is also known as the 'How dare you!' gambit. Example: 'How dare you suggest that the Branch Davidians were murdered! the FBI and BATF are made up of America's finest and best trained law enforcement, operate under the strictest of legal requirements, and are under the finest leadership the President could want to appoint.' Proper response: You are avoiding the Waco issue with disinformation tactics. Your high opinion of FBI is not founded in fact. All you need do is examine Ruby Ridge and any number of other examples, and you will see a pattern of abuse of power that demands attention to charges against FBI/BATF at Waco. Why do you refuse to address the issues with disinformation tactics (rule 2 - become incredulous and indignant)? 'You can't prove his material was legitimately from French Intelligence. Pierre Salinger had a chance to show his 'proof' that flight 800 was brought down by friendly fire, and he didn't. All he really had was the same old baseless rumor that's been floating around the Internet for months.' Proper response: You are avoiding the issue with disinformation tactics. The Internet charge reported widely is based on a single FBI interview statement to media and a similar statement by a Congressman, neither of which had actually seen Pierre's document. As the FBI is being accused in participating in a cover up of this matter and Pierre claims his material is not Internet sourced, it is natural that FBI would have reason to paint his material in a negative light. For you to assume the FBI to have no bias in the face of Salinger's credentials and unchanged stance suggests you are biased. At the best you can say the matter is in question. Further, to imply that material found on Internet is worthless is not founded. At best you may say it must be considered carefully before accepting it, which will require addressing the actual issues. Why do you refuse to address these issues with disinformation tactics (rule 3 - create rumor mongers)? 14. Demand complete solutions. Avoid the issues by requiring opponents to solve the crime at hand completely, a ploy which works best with issues qualifying for rule 10. Example: 'Since you know so much, if James Earl Ray is as innocent as you claim, who really killed Martin Luther King, how was it planned and executed, how did they frame Ray and fool the FBI, and why?' Proper response: You are avoiding the issue with disinformation tactics. It is not necessary to completely resolve any full matter in order to examine any relative attached issue. Discussion of any evidence of Ray's innocence can stand alone to serve truth, and any alternative solution to the crime, while it may bolster that truth, can also stand alone. Why do you refuse to address the issues by use of such disinformation tactics (rule 14 - demand complete solutions)? 21. Call a Grand Jury, Special Prosecutor, or other empowered investigative body. Subvert the (process) to your benefit and effectively neutralize all sensitive issues without open discussion. Once convened, the evidence and testimony are required to be secret when properly handled. For instance, if you own the prosecuting attorney, it can insure a Grand Jury hears no useful evidence and that the evidence is sealed an unavailable to subsequent investigators. Once a favorable verdict is achieved, the matter can be considered officially closed. Usually, this technique is applied to find the guilty innocent, but it can also be used to obtain charges when seeking to frame a victim. Example: According to one OK bombing Federal Grand Juror who violated the law to speak the truth, jurors were, contrary to law, denied the power of subpoena of witness of their choosing, denied the power of asking witnesses questions of their choosing, and relegated to hearing only evidence prosecution wished them to hear, evidence which clearly seemed fraudulent and intended to paint conclusions other than facts actually suggested. Proper response: There is usually no adequate response to this tactic except to complain loudly at any sign of its application, particularly with respect to any possible cover up. This happened locally in Oklahoma, and as a result, a new Grand Jury has been called to rehear evidence that government officials knew in advance that the bombing was going to take place, and a number of new facts which indicate it was impossible for Timothy McVeigh to have done the deed without access to extremely advanced explosive devices such as available ONLY to the military or intelligence community, such as CIA's METC technology. Media has refused to cover the new Oklahoma Grand Jury process, by they way. 22. Manufacture a new truth. Create your own expert(s), group(s), author(s), leader(s) or influence existing ones willing to forge new ground via scientific, investigative, or social research or testimony which concludes favorably. In this way, if you must actually address issues, you can do so authoritatively. Example: The False Memory Syndrome Foundation and American Family Foundation and American and Canadian Psychiatric Associations fall into this category, as their founding members and/or leadership include key persons associated with CIA Mind Control research. Read The Professional Paranoid or Phsychic Dictatorship in the U.S.A. by Alex Constantine for more information. Not so curious, then, that (in a perhaps oversimplified explanation here) these organizations focus on, by means of their own "research findings", that there is no such thing as Mind Control. Proper response: Unless you are in a position to be well versed in the topic and know of the background and relationships involved in the opponent organization, you are not well equipped to fight this tactic. 23. Create bigger distractions. If the above does not seem to be working to distract from sensitive issues, or to prevent unwanted media coverage of unstoppable events such as trials, create bigger news stories (or treat them as such) to distract the multitudes. Example: To distract the public over the progress of a WTC bombing trial that seems to be uncovering nasty ties to the intelligence community, have an endless discussion of skaters whacking other skaters on the knee. To distract the public over the progress of the Waco trials that have the potential to reveal government sponsored murder, have an O.J. summer. To distract the public over an ever disintegrating McVeigh trial situation and the danger of exposing government involvements, come up with something else (Flight 800?) to talk about -- or, keeping in the sports theme, how about sports fans shooting referees and players during a game and the focusing on the whole gun control thing? Proper response: The best you can do is attempt to keep public debate and interest in the true issues alive and point out that the 'news flap' or other evasive tactic serves the interests of your opponents. 25. Vanish. If you are a key holder of secrets or otherwise overly illuminated and you think the heat is getting too hot, to avoid the issues, vacate the kitchen. Example: Do a Robert Vesco and retire to the Caribbean. If you don't, somebody in your organization may choose to vanish you the way of Vince Foster or Ron Brown. Proper response: You will likely not have a means to attack this method, except to focus on the vanishing in hopes of uncovering it was by foul play or deceit as part of a deliberate cover up. One solution might be toll lanes added in middle near tracks. Consultants hired to figure out how to squeeze two more lanes onto MoPac Boulevard (Loop 1) say they'll likely unveil a tentative solution by December. These fourth lanes on each side of what is currently a six-lane expressway probably would be open only to buses and cars equipped to pay tolls with electronic windshield tags, according to John Kelly, a consulting engineer hired by the Texas Department of Transportation to devise short-term and long-term improvements to MoPac. Given the space constraints, Kelly said, the toll lanes probably would be segregated from the existing, free-to-drive lanes with painted stripes or perhaps with permanent, flexible pylons that bend back when hit by a car. The other lanes will remain free. Kelly said the agency will hold two open houses in September to gather comments and ideas from the public before releasing the recommended design two or three months later. If all goes as planned, Kelly said, the expansion, which would run from Town Lake to about Parmer Lane, could have federal approval by the end of 2007. At that point, construction would depend on the Texas Transportation Commission's setting aside money to do the project. To date, the commission has tended to look favorably on toll road projects. Kelly, a former district engineer with the state Transportation Department who now works for DMJM Harris, said the design likely would involve moving the inner edge of the freeway toward the Union Pacific railroad track that sits in the highway median as far north as RM 2222 before crossing over east of the highway. Engineers have little choice, given widespread and vocal community opposition about five years ago to plans at the time to widen the highway or build elevated sections. "If you can't go out and you can't go up, you have to go in," Kelly said. Kelly said the consulting team has met with Union Pacific to discuss how the highway might get some space while simultaneously leaving enough room for a second track to be added eventually for either freight service or passenger rail. He said the design also will take into account the possibility of having a passenger rail station at 35th Street. The Capital Area Metropolitan Planning Organization board, which governs transportation planning in Central Texas, voted in 2005 to allow MoPac from Town Lane to Parmer to add a "managed lane" on each side, stipulating that the road could not be widened. Managed lanes, in some projects, allow cars with multiple occupants to drive free along with those paying tolls. But Kelly said that in this case, with no physical barrier separating the lanes and no toll booths, it may make sense to allow only transit vehicles and cars with toll tags. Across the country, Americans fight to protect their property. Will the Government Take Your Home? But now the Gambles live in their daughter’s basement. Their house stands vacant in the weedy field that was their neighborhood—seized by the city and transferred to a developer who wants to build shops, offices and condominiums. Technically, it is a forced sale, because the government has to pay for the property. And it is legal: In June 2005, the U.S. Supreme Court ruled that state and local governments can seize homes to make way for private development. The decision in Kelo v. City of New London triggered a sort of government land-grab. In the one year since Kelo, more than 5,700 homes, businesses and even churches were threatened with seizure for private development, according to the nonprofit Institute for Justice (IJ), and at least 350 were condemned or authorized for condemnation. By comparison, about 10,000 were similarly threatened or taken over from 1998 through 2002. Government always has had the power to force the sale of private property for public use—a process known as eminent domain. But what is “public use”? Historically, it meant highways, railroads, schools and sweeping urban-renewal projects, such as the redevelopment of the Baltimore waterfront. But Kelo made clear that middle-class homes could be replaced with malls, offices, luxury homes—anything that might increase tax revenue. “It’s a blatant example of reverse Robin Hood—taking homes from the poor and the middle-income and giving them to the rich,” says Scott Bullock, the IJ attorney who argued (and lost) Kelo. But Kelo also has sparked a backlash. In the past year, more than two dozen states introduced or passed legislation and constitutional amendments to stop what critics call “eminent domain abuse.” Even the U.S. House of Representatives approved a bill aimed to restrict eminent domain. Residents also are fighting back through courts of law and public opinion. In Norwood, the Gambles and two other property owners represented by IJ brought their case to the Ohio Supreme Court. (At press time, the court had yet to rule.) [See editor’s note below.] In Long Branch, two dozen residents, also working with IJ, are suing to stop their neighborhood from being replaced with 185 condominiums. And in Lakewood, Ohio, my hometown, the people of Scenic Park waged such a successful public campaign three years ago that voters spared their homes from being taken. In each city, the process unfolded almost identically: A private developer, with the government’s backing, wanted a big piece of property—cliff-side homes with valley views in Lakewood, ocean-front cottages in Long Branch—and tried to negotiate deals with each owner. When some refused to sell, the cities threatened to invoke eminent domain to clear the holdouts. In order to do that, however, city officials first needed to declare the neighborhoods “blighted.” But the legal designation of “blight” bears little resemblance to a commonsense definition. In Lakewood, for example, Scenic Park is a charming neighborhood of older, well-kept homes. But because they lack such modern touches as attached two-car garages and central air-conditioning, the city deemed them blighted—a standard by which more than 80 percent of Lakewood, even the former mayor’s home, would likewise be blighted. “We always bit on the word ‘blight,’” says Julie Wiltse, 63, who helped neighbors distribute 20,000 fliers and sponsor a series of blight events: a Blighted Block Party, a Blighted Chili Cook-off, even a Blighted Groundhog Day (which predicted four more months of blight). TV cameras and newspaper reporters loved that stuff. “We were very successful in explaining to the community, ‘If we’re blighted, you’re blighted,’” Wiltse says. Likewise, the Hoaglands’ neighborhood in Long Branch isn’t “blighted” in any meaningful way. With one or two exceptions, it’s a few blocks of low-key bungalows where families have lived side-by-side for decades, even generations. The shabbiest touches, ironically, are the posters in nearly every home’s windows with the words “eminent domain abuse” inside a red-slashed circle and the several homes that have been bought by the developer and boarded up. What the area doesn’t have, however, are the $500,000 condos or the restaurants with $12 hamburgers that were built immediately south of the neighborhood. Neither do the Gambles. Most of the properties that the Gambles and their Norwood neighbors owned—6 9 out of 75—were sold to the developer, who was required by the city to pay at least 25 percent above market value. Three others later settled with the developer. Then the city used eminent domain to claim the last three, concluding that the neighborhood was deteriorating, based on a study that was paid for by the developer. Tim Burke, a lawyer for the city, argues that the government had to clear the holdouts, especially because there were so many other property owners who had agreed to sell. “Would Norwood have used eminent domain if it had to acquire 69 of the properties? Clearly not,” he says. But what if you’re one of those few? “That this is happening here,” says Joy Gamble, “in the land ‘ of the people, for the people, by the people…’” The thought trails off, and she just shakes her head. Stay informed: Eminent domain projects usually are years in the making—but quietly and without public reference to “eminent domain.” Watch for words like “redevelopment,” says Scott Bullock, a lawyer with the Institute for Justice. Make noise: March, rally, call local newspapers and TV stations. Try to turn community opinion to your side. Ask for help: Several organizations may take your case for free. But even if you have to hire your own lawyer, you can fight City Hall. Pester your state legislators now: Some states already have passed new rules that restrict eminent domain. Fight for the best deal: If you simply cannot save your home, make it as expensive as possible. An analysis by The Cincinnati Enquirer revealed that owners in Norwood, Ohio, were paid on average twice the appraised value of their homes. However, the ones who fought got even more. On July 26, the Ohio Supreme Court ruled unanimously that the city of Norwood can't use eminent domain to take Carl and Joy Gamble’s home solely for economic development. The United States Supreme Court had ruled previously that there is nothing unconstitutional about a government taking private property, with just compensation, solely for economic development but left it to state courts to decide whether such takings violated their own state constitutions. The Ohio Supreme Court further rejected Norwood’s claim that it also could use eminent domain to eliminate the Gambles’ neighborhood because it was a “deteriorating area.” The court ruled that the phrase “deteriorating area” was too vague—that it was, in effect, a standardless standard. The court ruling means the development group has to return the house to the Gambles. “Our state supreme court did what the the U.S. Supreme Court did not do: It protected our home,” Joy Gamble told reporters. The Port of Corpus Christi plans to commit $83 million to develop a new container terminal along the Gulf Coast. The Port of Corpus Christi is in negotiations with Dragados-S.P.L. in Madrid, Spain, toward a definitive construction and long-term concession agreement for the La Quinta Trade Gateway Container Terminal. The Port of Corpus Christi plans to secure the $83 million in funds from a range of sources, including project revenue bonds, state and federal grants, available cash, proceeds from the sale of general obligation bonds, private investors and federal loan programs. Under this plan, the Port of Corpus Christi would own the terminal while Dragados-S.P.L. would manage it under a long-term partnership. Dragados-S.P.L. has developed international port operations throughout Spain, South America, France, Portugal, Italy, Morocco, Chile, the Dominican Republic and China. The company has operations in port operation, shipping, transit, combined transport and specialized logistics. SAN ANTONIO - Apparently TxDOT didn't realize that San Antonio is the 2nd most populated city in Texas. In fact the Alamo city is. And TxDOT might take note that it is also the 7th most populated city in the entire United States. Really something we would have expected them to have already known. Hundreds of Texans were unable to attend and participate in the TTC-35 DEIS Public Hearing held in a San Antonio high school on August 8, 2006. When the East Central High School Cafeteria reached it's 600 person capacity the doors were closed. Many of those left standing outside had driven great distances, some from as far away as Houston. How did this happen? Was TxDOT unaware that metropolitan Bexar County's population had grown to near 2 million? Did they really expect that a meeting room with a 600 person capacity would be adequate, especially given the vigorous debate over the TTC and toll projects in Bexar County? This stands in stark contrast to Temple, population less than 55,000. When a stunning 1,600 people showed up for the TTC-35 DEIS Public Hearing in Temple, TxDOT needed only add an additional 100 chairs to accommodate the crowd. And that wasn't the only big turn out by Texans who want to let TxDOT know what they think about the TTC. Waco attracted more than 1,000 and 700 in Floresville, a stones throw from San Antonio. What were they thinking? Were they thinking? Some suspicious types might even suspect an evil plot designed to repel the thongs of unhappy citizens who or taking advantage of their right to express their unhappiness. Certainly people will give a second thought before drive to San Antonio if there's a chance they'll end up standing outside instead of listening and speaking inside. CorridorWatch.org however is more inclined to suspect it was just horribly poor planning. The kind of planning we fear will be commonplace with the massive Trans Texas Corridor project that's currently being designed in secret without coordination with regional transportation planners or meaningful citizen review and comment. Of course TxDOT will hold an additional Public Hearing in San Antonio in an attempt to reach those who were turned away. Will they move to a larger facility where everyone, even if there's more than 600, can be assured that they can get inside the building? No they won't. The next San Antonio DEIS Tier One Public Hearing will be held on Thursday, August 10, 2006, again at the East Central High School cafeteria, 7173 FM 1628, San Antonio, Texas. The meeting room will open at 5:00 p.m. for open house style displays and discussion with a formal presentation beginning at 6:30 p.m., followed by oral comments from the public. Is the Trans-Texas Corridor I-69 really on it's way? Here's a picture our friend Nate* took today. They had these about every five miles up and down Hwy 183 and Hwy 77 down around the valley. The last one came from his photo shop. And here's a link that you can go to for a look at their bigger plans. What concerns us is that the required TX-DOT public hearings are not over. TX-DOT has made very little, to almost none, of this information about the roads they plan to build and the hearings available to the public when requested via the open records act. 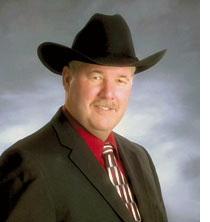 They plan to remove farmers and ranchers from their land using eminate domain laws in HB 3588, and HB 2702. As far as we know there has never been an election anywhere to decide that we want to build these routes, or that we want to have Trans-Texas Corridors for Texas. And, Governor Rick Perry has signed an agreement with a Spanish corporation CINTRA, which to this day remains unavailable to the public for review. Here's a letter to the editor that I found from two years ago when CAMPO voted to implement a toll road system on Austin roadways. It is timeless in it's message, so I'm reprinting it here. If there's an ounce of dignity and integrity, and the need to do the right thing, we must speak out against the Central Texas toll road plan. Contrary to the propaganda slung by the governor, the Capital Metropolitan Planning Organization, the Texas Department of Transportation and other special-interest entities, the toll plan is not in the best interest of Texans. The majority of Texas residents do not want toll roads. However, officials (elected and otherwise) continue to push aside the will of the people they serve. Any reasonable person must be able to see that toll roads merely are another form of regressive taxation. While we're told that there are options in place for those who do not want to pay the tolls, the reality is quite different. All Texas consumers will pay tolls, whether they use the toll roads or not. We will all pay tolls many times over in purchasing goods and services from businesses that will use the toll roads. Inevitably, businesses pass along such costs to their consumers. In addition, many of the roads slated for tolls already have been paid for with tax dollars. How many times should we pay for the same road? Toll roads are nothing more than special-interest profiteering. The toll plan should be eliminated, because the people of Texas don't want it. Special-interest officials must not determine the direction of our transportation needs. Texans must decide what is in their own best interests -- or at least the plan should be part of a public referendum. SUBMIT COMMENTS AGAINST CORRIDOR NOW! reviewed by the Federal Highway Administration. This may not have an impact right now, but it is important to have these objections on the record, for future efforts. state at as many hearings as possible, supplemented by local volunteers. A HUGE THANK YOU TO OUR ACRE PEOPLE WHO CAME OUT TO THESE HEARINGS! It is hard to get out to an evening hearing, but so many of our group did. The Manor hearing had about 200 attendees; about 11 people there supported the Corridor. Everyone who spoke was against it. All the candidates who spoke at the Manor hearing opposed the Corridor, including Fred Head, Democrat for State Comptroller; Rock Howard, Democrat for State Senate; Ted Ankrum, Democrat for U.S. Congressional District 10; and Michael Bednarik, Libertarian for Congressional District 10. Also speaking were Fancy Fairchild and James Shive, who heads up the fight against tolls on U.S. 290 East (Keep290Free.com), and Mary Anderson, co-director of Texans Against Tolls. Barbara Samuelson, who opposed Krusee in the Republican primary, and who is a filmmaker, was outside the hearing filming people’s comments against the Corridor for her Trans-Texas-Corridor documentary. While out on the road this past few weeks, I've been going to the TX-DOT hearings for NEPA--National Environmental Protection Act, to find out what the local people, the farmers, and ranchers are saying about how the Trans-Texas Corridor will impact their lives, their businesses, and their environment. I've been there to learn, to listen, and to meet folks who see lots of problems with this proposed (1200+ ft.) over sized pork trough, and to find out who's running for office that might offer some solutions. As I consider myself to be an independent voter, trying not to endorse one party over another, I just look for the best qualified candidate who will work for the best interests of the people of Texas. At some of the hearings I met, and heard speak, a fellow named Hank Gilbert, Democratic Candidate for Agriculture Commissioner, who clearly says in his speeches "No Toll Roads, and No Trans-Texas Corridor, and No (NAIS)---National Animal Identification System." Folks are saying there are other good reasons he may make a good Agriculture Commissioner. Hank Gilbert's Republican opponent, Todd Staples authored the Trans-Texas Corridor legislation (HB 3588) along with some other not-so-honest guys that will make sure YOU drive home on a toll road. From the way the testimony is going at the TX-DOT hearings, no one wants the toll roads, or the Trans-Texas Corridor (TTC), or the abuses of eminate domain that the bill packs with it. Imagine paying more than $18/day just to drive to and from work. And, believe me, folks in the rural areas have a lot of expensive driving to do these days. But, that's the Staples and Perry TTC plan for transportation, to take it out of the hands of Texas families who have owned it for generations, and to long-term-lease this big tract of Texas land to a private corporation, part of it originating in Spain (CINTRA-Zachery). Here's more of what Hank Gilbert is saying, and Fred Head, Candidate for Comptroller of Public Accounts Agrees! Toll Roads cost too much, do too little. Family farms torn apart by the hundreds of thousands of acres changed from agriculture to toll roads. Increases property taxes for everyone in the State of Texas. Toll roads destroy the existing taxable land, driving up taxes for everyone whose land isn't taken by the State for the TTC. Roads will be leased by a foreign company (CINTRA) with questionable finances for their exclusive benefit. If the tolls don't pay enough to CINTRA, then Texas taxpayers will bear the burden. Land for toll roads will be taken from private property owners, destroying family farms and residences in their path. Toll roads will hurt small businesses who can't afford to relocate or pay a massive concession to CINTRA. TTC will destroy agriculture, one of the backbones of the Texas economy, by making it impossible for farmers and ranchers to obtain financing. Widen existing federal highways with federal dollars. Keep existing business in our towns and cities alive. Safer and better for the environment. 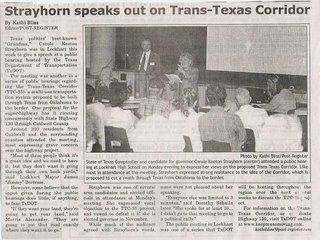 I attended this TX-DOT hearing in Lockhart on Monday, and one in Gonzales on Tuesday, where Carole Strayhorn spoke. Click here and you might be able to download a rough clip of her live speech. I scanned the article from the Lockhart Post-Register. Attached. Sounds like the Mayor and Mr. Morris Alexander and Dorothy Schulle and Kathi Bliss have an agenda.